I love shooting weddings across all cultures, and have had the privilege to shoot numerous Orthodox Jewish weddings in and around Los Angeles and Beverly Hills. I actually live right in the heart of the second largest Orthodox population in the United States (with the largest being in New York), and as such, have always had a great affection for the Orthodox Jewish community. 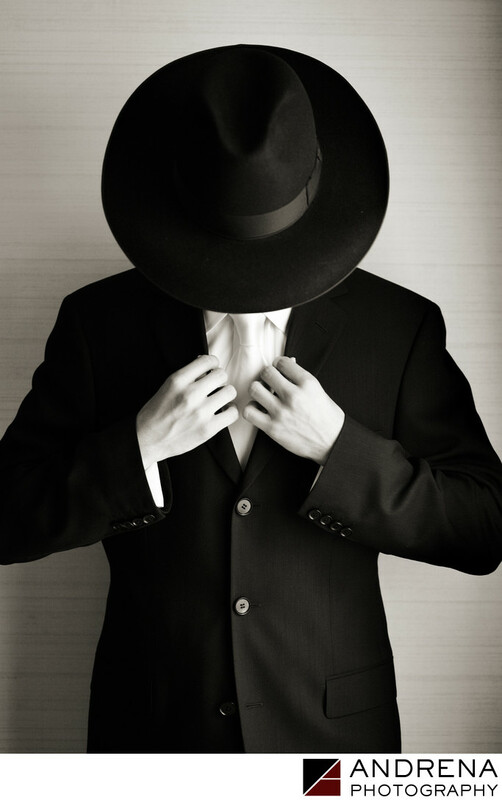 I have also had great affection for the black hats that the men don starting after their bar mitzvah. For this portrait, which was taken against a simple wall in a hallway at the Beverly Hilton Hotel, I asked the groom to bow his head down until the hat just covered his face. I then asked him to hold his lapels, taking care to position his hands symmetrically. The end result got a wildly positive reaction when I first posted this photograph on a professional photography forum that I was a member of. Interestingly, I have tried to recreate this photograph at several other Orthodox Jewish weddings, but it's never worked out quite as well as this one. Orthodox Jewish wedding photographed at the Beverly Hilton Hotel.